A suburban Boston school unwittingly started a firestorm of controversy over a sixth-grade field trip. The class was visiting a mosque to learn about world religions when a handful of boys, unnoticed by their teachers, joined the line of worshippers and acted out the motions of the Muslim call to prayer. A video of the prayer went viral with the title “Wellesley, Massachusetts Public School Students Learn to Pray to Allah.” Charges flew that the school exposed the children to Muslims who intended to convert American schoolchildren. Wellesley school officials defended the course, but also acknowledged the delicate dance teachers must perform when dealing with religion in the classroom. Courts long ago banned public school teachers from preaching of any kind. But the question remains: How much should schools teach about the world’s religions? Answering that question in recent decades has pitted schools against their communities. Veteran education journalist Linda K. Wertheimer spent months with that class, and traveled to other communities around the nation, listening to voices on all sides of the controversy, including those of clergy, teachers, children, and parents who are Muslim, Jewish, Christian, Sikh, or atheist. In Lumberton, Texas, nearly a hundred people filled a school-board meeting to protest a teacher’s dress-up exercise that allowed freshman girls to try on a burka as part of a lesson on Islam. In Wichita, Kansas, a Messianic Jewish family’s opposition to a bulletin-board display about Islam in an elementary school led to such upheaval that the school had to hire extra security. Across the country, parents have requested that their children be excused from lessons on Hinduism and Judaism out of fear they will shy away from their own faiths. But in Modesto, a city in the heart of California’s Bible Belt, teachers have avoided problems since 2000, when the school system began requiring all high school freshmen to take a world religions course. Students receive comprehensive lessons on the three major world religions, as well as on Sikhism, Hinduism, Buddhism, and often Shintoism, Taoism, and Confucianism. One Pentecostal Christian girl, terrified by “idols,” including a six-inch gold Buddha, learned to be comfortable with other students’ beliefs. 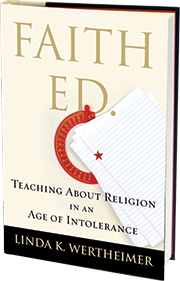 Wertheimer’s fascinating investigation, which includes a return to her rural Ohio school, which once ran weekly Christian Bible classes, reveals a public education system struggling to find the right path forward and offers a promising roadmap for raising a new generation of religiously literate Americans.